MOSCOW (AP) FIFA has issued a formal warning to a Croatia player who praised Ukraine in a video after his team beat World Cup host Russia. The video shows Croatia defender Domagoj Vida shouting ”glory to Ukraine” before the retired ex-player Ognjen Vukojevic adds ”this win is for Dynamo and Ukraine … go Croatia.” The statement angered many Russian social media users amid the political tension between Russia and Ukraine. Vida and Vukojevic played together at Ukrainian club Dynamo Kiev. 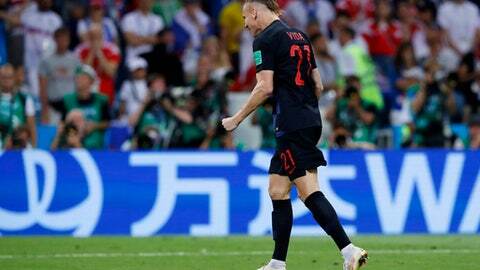 Vida was a star of Croatia’s win on penalties over Russia on Saturday, scoring a header in extra time and converting a penalty in the shootout. ”We can confirm that FIFA’s disciplinary committee has sent a warning to the player Domagoj Vida due to his video statement following the 2018 FIFA World Cup match between Russia and Croatia,” FIFA, the sport’s international governing body, said Sunday. It wasn’t immediately clear whether Vida and Vukojevic intended the video to be made public, or if it was later uploaded to YouTube by someone else. Vida told the Russian newspaper Sport Express he meant the video to be a personal message. Tensions have been high since Russia annexed Crimea from Ukraine in 2014. Ukraine’s government accuses Russia of arming pro-Russian separatists who control part of the east of the country, and of backing up the separatist groups with Russian military forces. Vukojevic was appointed last year as a scout for Dynamo after a lengthy playing career which included being part of the Croatian squad for the 2014 World Cup. FIFA can fine or suspend players for political gestures at the World Cup. Three Swiss players were fined for making hand gestures referencing the Albanian flag during a 2-1 win over Serbia in the group stage. Croatia faces England on Wednesday in the country’s first World Cup semifinal game since 1998.